So this is Christmas for Captain Atom. Morose and bittersweet. I know a lot of Captain Atom fans are not Christian and do not necessarily celebrate December 25 as the birth of Christ, but Nathaniel Adam was raised Catholic. So I apologize to anyone if they find anything about this post offensive, but I assure you I am not another pig-headed American trying to force his own religion or politics down anyone’s throat. I see this as just a plot device. For those of you who are Christian, I wish you a happy Christmas. To those of you who aren’t, but still celebrate Christmas, a happy Christmas to you as well. Also, happy Hanukkah, Kwanzaa, Festivus, Boxing Day, Day of Goodwill, Slovenia Independence and Unity Day, HumanLight, and whatever significance this time of the year holds for you. This issue of Captain Atom, cover dated March 1988, hit the spinner rack on December 8, 1987. It introduced two new supporting cast members (Chester King and Harris Eling [the first Eiling I’ve actually genuinely liked]), and reunited Captain Atom with his old Charlton partner and girlfriend Nightshade (Eve Eden). It also featured Enemy Ace, a strange character to be found in a Captain Atom book, but it works. This issue opens with Nate standing on a bridge in a snowy park overlooking a small body of water on Christmas Eve. He chucks his “Cameron Scott” ID into the water. In Captain Atom Annual #1, Nate resigned from the Air Force. 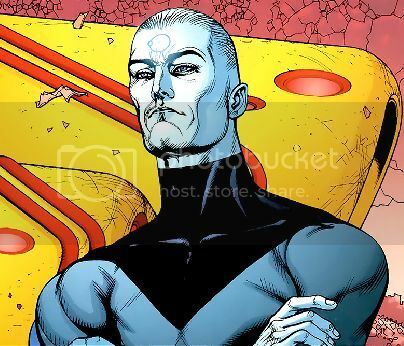 He cut all ties with General Eiling, Dr. Megala, Lieutenant Allard, Major Force, and all the other knuckleheads associated with the Captain Atom Project. But he’s still using the fake identity they provided him with. Nate feels he is truly free of Eiling. The General has been keeping Adam in line by threatening to tell Peggy and Randy the truth about their father. But now Nate feels he has a card that trumps Eiling’s – Major Force. Noting that the snow makes visibility in the park nearly zero, Nate transforms into Captain Atom, burning away his Air Force uniform in the process, and flies away. So lost in thought is General Eiling that he does not hear his father calling him. Harris (Eiling’s father) wants to know why his son is so preoccupied. But Eiling tells his father he can’t discuss “matters pertaining to national security.” Harris asks his son to try and put his worries aside so that they – and Randy and Peggy – can have a happy holiday. Back in his apartment (probably in Washington, DC), Nate is going through his bills. On the coffee table in front of him is the saddest looking Charlie Brown Christmas tree. The apartment is littered with bachelor trash and empty cans (but fear not, Captain Atom fans, it appears Nate has been binge-drinking soda – not beer). His bank account is dwindling, his friends and family are all out of town, his wife is dead, and he’s sad and alone on Christmas Eve. But he looks at the bright side – Eiling is no longer in his life. So this “Mr. Wiley” and Chester are involved in some sort of insurance fraud scam. Chester hangs up the pay phone and is approached by a homeless man who says his name is Bubba. He asks Chester for a quarter and Chester gives Bubba a wad of bills. Back at the Eiling house, Randy and Peggy are frolicking in the snow while Harris watches from a window. He tells General Eiling it reminds him of the first Christmas he spent with them after his son married Angela Adam. Harris quickly realizes his son isn’t listening to him; he is on the phone with Allard. General Eiling shoos his father out of the room, citing “national security” again. Next we see Nate walking the streets of D.C. (and he identifies it as Washington, D.C., so mystery solved!) in a foul mood. He has no one to spend the holiday with, thinking to himself that even Dr. Megala and Babylon are with friends. He is also approached by the homeless Bubba, asking him for a dollar. Nate gives Bubba a quarter, saying it is all he can spare. Chester King, meanwhile, is breaking into the abandoned tenement, setting the explosives while thinking to himself how happy his wife is going to be with his bonus and a surprise trip to the Bahamas. He refers to the condemned building as “the Dixie,” and that it is an eyesore anyway. Chester bursts into his favorite watering hole, Smitty’s Bar, buying a round for everyone there. In a dark corner sits the morose Nathaniel Adam, feeling out of place. Even here, in a bar, we don’t see Nate drinking alcohol or beer. I guess it wasn’t super-hero-like to be depressed and drinking. But didn’t Tony Stark (Iron Man) have a well-documented drinking problem? Not to mention Green Arrow’s pal Speedy being a heroin junkie. I guess Bates and Weisman wanted to keep Captain Atom light by not showing him drinking. However, he is clearly holding a beer on the cover. I’m overthinking this. Back at the Eiling house, Harris is regaling Peggy and Randy with a tale from his own RAF days. Stuck in the skies over Germany in World War I with a fuel leak in his Nieuport 10, Harris encountered Hans von Hammer – a.k.a Enemy Ace. Faulty plane or not, Harris couldn’t pass up a chance to shoot down the German who had racked up “close to 70 kills since the war began.” Von Hammer, in a brilliant aerial maneuver, looped over Harris and became the pursuer rather than the pursued. But Enemy Ace never fired on Harris Eiling. He saw that the Nieuport was disabled and let the RAF pilot go. He even gave Eiling a salute. It was against his “battle code” to take down a disabled opponent. But Harris didn’t live by the same code, and fired on Enemy Ace with his sidearm in vain. Later in life, he regretted taking those shots. He felt it was dishonorable. General Eiling gets really pissed off by his father’s revelation. He calls it the biggest load of crap he’s ever heard. He says his father has gone soft and is senile. He storms out into the snow without putting on a coat. At Smitty’s Bar, a man crashes in, saying the old Dixie Hotel is on fire. The patrons go out to watch the fire. Someone comments on “those poor squatters.” This alarms Chester. Mr. Wiley never mentioned squatters. The onlookers try to organize a rescue but don’t know what they can do. Except one of those onlookers knows exactly what to do – Nathaniel Adam. As Nate ducks into an alley to do his super-hero switcheroo, Chester sees a man on fire run from the building. He throws the man into the snow, smothering the flames with his coat. With horror, Chester realizes the man is Bubba, and watches him die. That is when the full scope of what he’s done hits him. His friends pull him away from Bubba just as Captain Atom bursts on the scene. Nate thinks to himself that, even though he’s been super-heroing for over a year, this feels like his first time out. He protects some of the squatters from falling debris before absorbing the smoke and flames. At the Eiling house, the General is holding his hand over the flame in the fireplace. He tells his father he will not tolerate any more “weak-willed molly-coddling” in front of his children – especially Randy. Neither the General nor his father realize that Randy is listening to their conversation, looking a little distressed. In D.C., firefighters are finishing up at the Dixie. One of the men returns Chester’s coat, calling Bubba a “bum,”which angers Chester. He walks home, despondent over what he has done. Passing a bell-ringer collecting money for charity, Chester drops $5,000 into the man’s bucket. At Smitty’s, the patrons are lifting Captain Atom up and cheering him. Nate thinks he’s never felt so close to being a real super-hero. A blonde woman in the bar flirts with Cap. She says she’s Eve Eden, and that she and Cap have a mutual “uncle” who asked her to keep an eye on him. Nate asks her out and they walk out of the bar, hand-in-hand. Eve Eden is, of course, Nightshade. The cover alone warrants an A+.